Blood in His Wake collects the first six issues of Dark Horses latest stab at the saga of Robert E Howards’ most famous creation. The book opens with a half dead Conan staggering across a blood dimmed desert toward the ‘certainty of his own demise’. Death waits before him, death lies in his wake and from the bleak opening frames of Red Sonja penciller Sergio Davila’s gore sodden artwork, it is evident that we are in for some bloody handed business as the titular Cimmerian is pursued across blistering sands by a gang of Turanian huntsman. 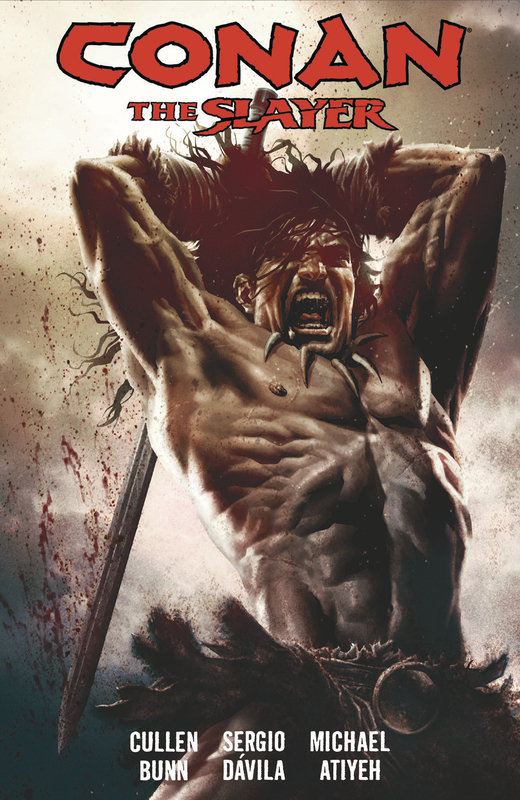 Harrow County author Cullen Bunn takes the reins here and his take leans heavily on the whole prophecy of doom aspect of Conan and I love it. There’s drama and tension on every page and still peppered with enough course wit and self-aware tough guy posturing to keep the whole thing from becoming too po-faced and disappearing up its own arse. Special mention has to be made of Davila’s stunning artwork because this is the fiercest Conan I’ve seen since Marvel’s Savage Sword era. Mountains of ragged corpses, circling vultures and explosive dynamism, each panel succeeds in drawing you further into the story, the perfect accompaniment to Bunn’s furious words. Even the way in which the text has been presented, in a scrappy type writer feels like old Two Gun Bob is feeding you the narrative straight from his own pugnacious mitts. My only criticism with Blood in His Wake as a whole is that at certain points it feels cluttered with bad guys. Ultimately they are all destined to be gristle for the crows but with so many factions lining up for their pound of Cimmerian flesh, it becomes difficult to view them as individuals rather than cardboard bad guys. That feels like a missed opportunity because Bunn has clearly demonstrated he’s got a handle on nailing personality.